Welcome to another instalment of my new blog series, where I interview fledgling freedom-preneurs about their first baby steps in business. By sharing their stories, warts and all, the aim is to help you find more clarity as you start out on your own business journey, get inspired, and see that all entrepreneurs have to start somewhere! 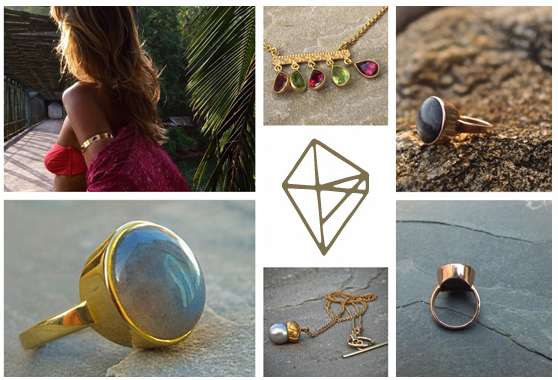 So this month we are chatting with jewellery designer Rosie Odette, who swapped running restaurants for sourcing and designing stunning jewellery from India. So how long have you had your business? I started out as a goldsmith having trained in Hatton Garden in June 2014. Then I travelled to India where I carried on working as a goldsmith and made my first bespoke high-end collection. I then found a manufacturer there and design two new collections, and went on to launch my website in 2015. Did you have any business background or experience before you started? I had no previous background in business but had worked in the service industry for years and ran restaurants. The people management, customer service, and organisational skills I picked up were really useful and transferrable, as well the grit, tenacity and ability to long hours. Is there anything that you spent time/money on, that now with hindsight, you would do differently? In hindsight you can over-order stock, but I'd rather be ready and have stock, then tell a customer what they want isn't available. But it's also never a bad thing to sell out. Stock balance is an ongoing balancing act, because in every market the most popular things are always different! I got my first customer from the first ring I made; a ruby ring made in silver. She loved it and asked if I could make her one. That was only three weeks into my training, and I had just happened to source two rubies from Goa earlier that year. Clients continued to contact me from seeing my posts on Facebook and it took off from there. I'm going into my third year now. They say the first three are the hardest, then you plateau a bit, then it's two more years before you are out of the woods. What tips do you have for starting a business whilst still in your 9 to 5? It's tough. You need vision, passion, tenacity, grit and a great product that you love. Business is also about relationships and having the inner strength to carry on when the going get tough. I didn't start with a business plan or cash flow, that all came later and I'm glad it did. If someone had showed me what I would go through I possibly wouldn't have started! However it's a blessing really, learning to jump through hoops. I've come so far against the odds, and invested so much that I can't go back now. It’s like a marriage, you've got to make it work. You have to keep on asking yourself the question - is it worth fighting for/will it pay off in 5 years time? If the answer is yes, then keep fighting for it and find a way. Not having a plan was the best thing - as I just grew with it and had to get creative. You make it work. The gold is in how much you grow as a person, especially when time and time again you're given the choice to give up. If you can keep a 9-5 job going great, but at some point you have to leap and just give your business your full commitment. Having savings is helpful, but can also make you not work/ strive as hard so it's a catch 22. It's also about conquering the fear of failure and taking the leap. As the saying goes "leap and the net will appear”.